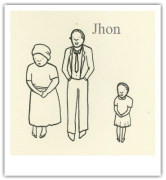 Setting up an NGO to improve healthcare in Uganda and across Africa was a dream for Jhon. He is a Ugandan dentist and in 2010, Jhon happened to meet British-based dental student, Ruth Lambeth. Ruth volunteered at Double Cure medical centre in Mpigi town through a link with her church and completed her first tooth extraction under Jhon's supervision. Ruth was shocked at the low levels of dental equipment available to dentists in this area and decided she wanted to help improve the situation upon her return to England. Jhon and Ruth exchanged emails and before they knew it, they had decided to register an NGO so that they had more chance of getting dental equipment out to Uganda. In December 2010, Ruth asked her friends Elizabeth Bailie and Laura Cuddon-Large whether they wanted to get involved in this project. Mwenya Uganda was born! That Christmas, the UK team sat around Elizabeth's dining room table doodling logos, coming up with names and thinking of possible website designs. Meanwhile in Uganda, Jhon was extremely busy recruiting many Ugandans to join the cause and help him establish Mwenya. To prove to the authorities that we were serious, we were asked to carry out some small scale activities within the local community. The UK team set to fundraising and sent the Ugandan team a small amount of money so that they could carry out elderly outreach projects in the rural areas around Mpigi town. By this point, Jhon had recruited enough volunteers to help patch up roofs, collect water, wash clothes, cook and dig latrines for Mwenya's first beneficiaries. After much hard work and jumping through hoops, Mwenya Uganda was registered as an NGO in May 2011. As the project grew, so too did the team of volunteers. By June 2011, Jhon had recruited over 80 Ugandan volunteers, from all professional and economic backgrounds. In June 2011, the Ugandan team organised their first mobile outreach clinic. Funded by efforts from the UK team and their student friends, Mwenya Uganda's first mobile clinic was held at Bussi Island on Lake Victoria. At the time this island had no public health facilities, despite being home for more than 12,000 residents. Laura Cuddon-Large and Elizabeth Bailie managed to travel to Uganda for this great event and meet the Ugandan team for the very first time. The team treated over 900 patients in one day and there were over 45 Ugandan volunteers present, many of whom came from local school on Bussi Island. There were articles in the newspaper and reports on television and the whole island was shouting 'MWENYA!' that day. Our thanks go to Bussi Island Secondary School for allowing us to hold our first ever clinic in your buildings, without your support it would not have been possible. Meanwhile, back in the UK, Justin Turner - a student at The University of Exeter and Website Designer - had kindly donated his time to put the UK Team's website ideas into a reality. Illustrator Nic Farrell also donated some of her time to complete the drawings for our first website design. Laura and Elizabeth returned to the UK with every confidence in the Ugandan team and a new website- Mwenya was progressing, and very fast for that matter! The Ugandan team organised another dental outreach in December 2011. At each event, it was clear that the situation was much worse than we had originally thought. Many patients were explaining to the dentists that they put petrol or urine in their mouths, in the hope that it would stem their pain. This lead Jhon to recruit more and more volunteers and by this stage Mwenya had established a core committee of Ugandan volunteers who were running Mwenya on a day-to-day basis. July 2012 saw Mwenya Uganda's official launch in Mpigi town. With a marching band, a two day clinic and the UK team staying in Mpigi, this was the biggest event that Mwenya had held to date. The District Health Officer was present and many of the authorities attended to better their understanding of what was soon becoming one of the most successful NGOs in Mpigi District. During the UK team's stay with Jhon, Tina and the team, there were many meetings to discuss the future of Mwenya and how we could ensure the long-term sustainability of the organisation. The UK and Ugandan team decided that we must establish Income Generating Projects in Uganda. Thanks to the Bristol Alumni Foundation and Sabano Night, Mwenya was able to take over the only dental clinic in Mpigi. It would run as a social enterprise, with all profits being pumped back into Mwenya Uganda and funding dental and medical treatment for rural communities. By this stage we were able to pay a fair wage to Jhon, as our permanent dentist, and Tina, our Office Secretary. The clinic income also covers all day-to-day costs such as office rent and internet credit. At the beginning of 2013, Mwenya Uganda - after barely two years of being registered - was voted the second best NGO in Central Region of Uganda, after none other than The Red Cross! The dental clinic was not enough to raise enough money for Mwenya's proposed projects. By this stage, Elizabeth Bailie was in her final year at University of Exeter and she decided to partner with Enactus society. An entrepreneurial society that works to empower people across the world through business. She started and led Enactus Exeter's first African International Project, Helping Uganda Do Business. By recruiting a dedicated team of 12 knowledgeable and passionate students, the idea was to help the Ugandan team maximise the design of their social enterprises. To cut an extremely long story short, this team of Enactus volunteers, led by Elizabeth, one of Mwenya's co-founders, traveled to Uganda in June 2013 to help the Ugandan team kick start two social enterprises in two weeks! The projects were a sustainable mushroom farm and a responsible tourism project. The Enactus volunteers left Uganda after an extremely productive two and a half weeks, leaving behind a fully designed and tested 'Mwenya Tour' with a trained guide, a mushroom reproduction laboratory, five mushroom deals with restaurants in Kampala and a fully formed business plan and set of accounts. In July 2013, thanks to Helping Uganda Do Business's fundraising efforts, the Ugandan team were able to purchase their first motorbike - a crucial step in reducing costs of the mushroom business and enabling more outreaches for Mwenya. Mwenya Uganda's story is growing every day...our little illustrations are getting more colourful and more complex as the Mwenya team grows and we reach out to more generous people.